President Donald J. Trump has signed an executive order that demands that colleges and universities adhere to free speech requirements, or they risk losing their federal funding. “The president strongly supports free speech,” a senior administration official told reporters during a briefing before the signing of the order. According to Fox News, a senior administration official said the order directs 12 grant-making agencies to use their authority in coordination with the White House Office of Management and Budget (OMB) to ensure institutions that receive federal research or education grants promote free speech and free inquiry. White House officials have said it will apply to more than $35 billion in grants. 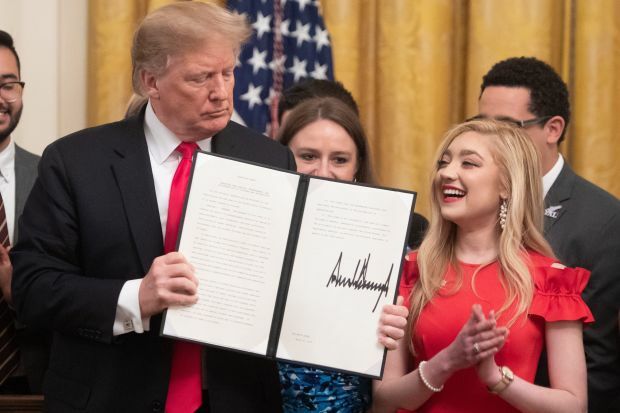 The executive order is fulfilling on a promise to issue such a directive Trump made at the Conservative Political Action Conference (CPAC) last month, where he said he would require colleges and universities to support free speech in exchange for federal research dollars. At CPAC, the president brought Hayden Williams to the stage with him, a conservative activist who was physically attacked while working a recruitment table on campus at the University of California-Berkeley. The video quickly went viral, with conservatives using it as evidence of how colleges have been stifling conservative views on campus.